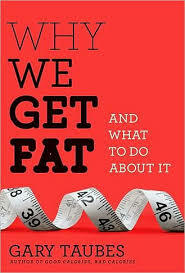 a book chick: "Why We Get Fat"
my take: This is a treatise on why the calories in/calories out paradigm that is touted by medical experts, exercise gurus, and weight loss plans is incorrect. A myth. A falsehood. Gary Taubes wrote Good Calories Bad Calories several years ago after researching why so many people are fat and that many, many people exercise a lot, eat little and remain fat. That work is, apparently, a tome and many people asked him to write a shorter, easier to read version. In Good Calories he included all the scientific evidence/studies/experiments which he collected/studied on which he based his studies and it was a bit tough to get through. The take away is that it's the kind of food we eat that most determines whether we get fat - other contributing factors are hormones and some genetics - and that calorie restrictive diets only work for a short time because the body needs calories for energy and will always return to demanding enough calories to do the work/have the energy for the life we ask of it. Based on his gathering of scientific research, it's the carbohydrates - all carbs except leafy green type veggies - that pack on the weight. So, pastas, breads, chips, fruit, juices, sodas, beer, potatoes, etc. are the culprits. He includes a recommended diet (and here he means diet in the truest sense of the word - what one eats) as the "what to do about" from the title. I would love to hear from experts, especially MDs (particularly my friend David), who have read the book to see if the science presented here is thorough and well-rounded enough to draw this conclusion. In the meantime, I'll be cutting out most carbs as a personal experiment. And exercising for pleasure.